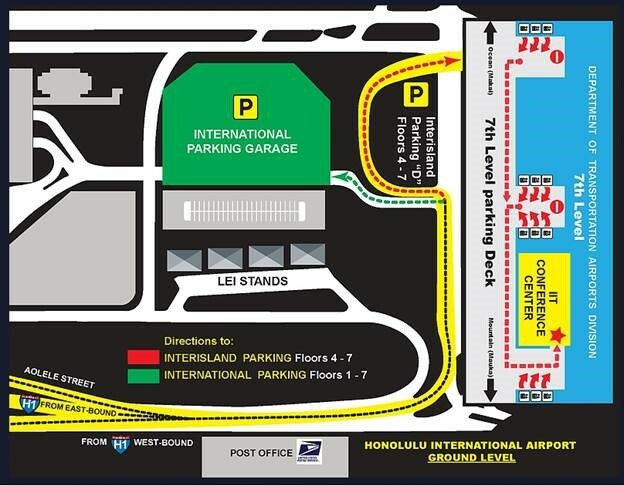 HONOLULU – The Hawaii Department of Transportation (HDOT), Airports Division is hosting a Career Fair at the Daniel K. Inouye International Airport for persons interested in working for HDOT. The fair will present job seekers with various employment opportunities with our Airports, Harbors, Highways, and Administration Divisions. June 16, 2017, 10 a.m. – 2 p.m.
Attendees will be informed of various opportunities that exist with HDOT. Speakers will present every 30 minutes during the fair to share valuable information about their programs and mission. Division representatives are available to answer questions and provide guidance to attendees. There will be a $3 charge for validated parking but the event is free. 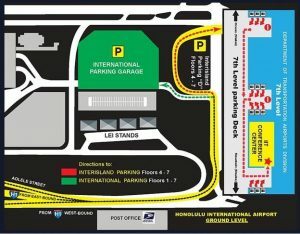 Parking is available in the Interisland parking lot and International parking lot. See map below. Interested applicants must register online here https://ck6436.wixsite.com/hidot-career-fair and submit their resume to dot.air.jobs@hawaii.gov. Only the first 1,000 applicants can be accepted due to space and time constraints. For more information, please view the event flier here.